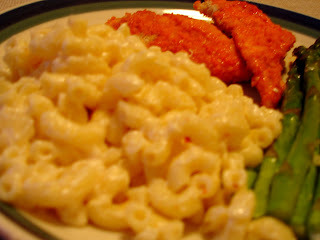 I was craving a creamier version of my mac n cheese to go with dinner tonight, so I experimented with a few things. It worked! This was the creamiest (note, not the healthiest) mac-n-cheese I've ever made. Jon also liked it more than my usual recipe. I served it with my buffalo chicken strips. - Add milk and 1 cup of the cream slowly. Add softened cream cheese. Also add the cayenne and red pepper flakes. - Turn heat down to low and slowly add cheeses, stirring constantly. This will turn into a smooth and creamy sauce. - Pour cooked noodles into the sauce and stir, coating every noodle. Add salt if needed. - I like to bake the mac n cheese a bit so I transferred everything to a baking dish and poured the rest of the heavy cream over it. It baked on 350 for about 10-15 minutes. This recipe is amazing and SO simple. Instead of using regular elbow noodles (and to make me feel less guilty for eating so much), I used Barilla Plus elbow noodles. They have tons of protein and Omega-3's. Additionally, I used 8 oz. of lite cream instead of the heavy cream. I also suggest topping it with panko bread crumbs and baking it for 15 minutes. Enjoy!! I definitely have to try those noodles. Thanks!